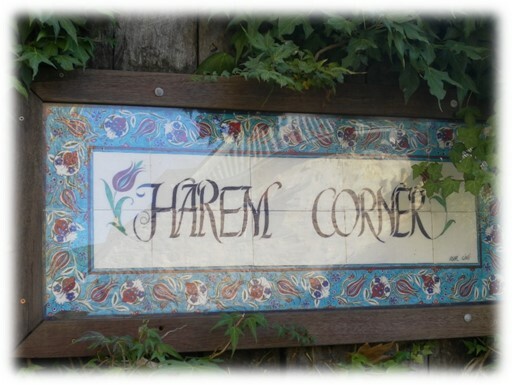 From time to time during my travels, I come across signs that I find interesting for one reason or another. Sometimes, they contain clever writing, are humorous, or remind me of some place or event. Here are some more from a trip to Australia in 2015. Kangaroos known to cross the road in this area. 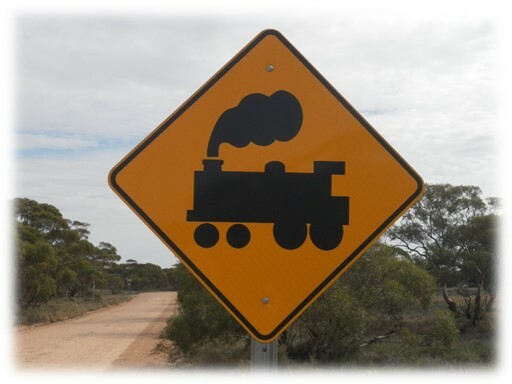 In some places, the bushland is quite close to the edge of the road, in which case, if you are traveling at any sort of speed, you have no chance of avoiding one hopping out onto the road. And this is especially true at night regardless of whether the sides of the road are clear or not. My brother had one hop right onto the hood (AU: bonnet) of his car, and come through the windshield (AU: windscreen) into the passenger compartment, all the while kicking with its back legs. That sort of an accident can ruin your whole day! 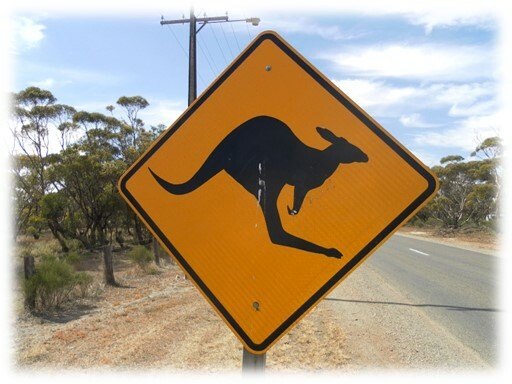 By the way, kangaroos usually don't hop unless being pursued. Instead, to move around, they sit back on their tail, move their back legs forward, then move the tail forward between their legs, and then repeat that process. 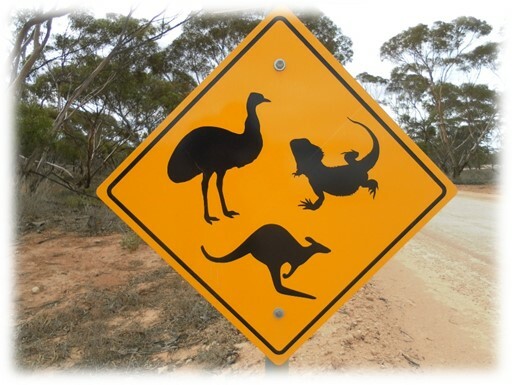 These signs always show the animals jumping from the left, but don't take that literally! And do they really jump or hop? I thought that hopping was one leg only while jumping uses both. I've never seen one hop. 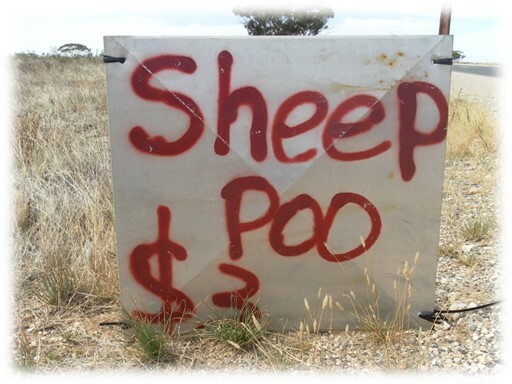 I found this sign rather amusing, since all my years in Australia, we used the word manure. Now, poo seems to be in fashion. I'm reminded of the story about President Truman. His daughter, Margaret, had invited a young man to dinner at the White House. After the meal, the President excused himself from the table and said that he had to go and put some manure on the roses. Margaret was quite embarrassed by his language and asked her mother to do something about it. Her mother replied, "If you only knew how long it took me to get him to say manure!" 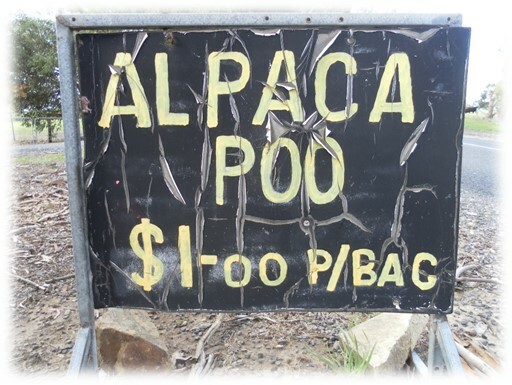 So what are alpacas doing in the Aussie bush? Most I saw were in with sheep acting as some sort of protectors. I hadn't seen them on previous visits. 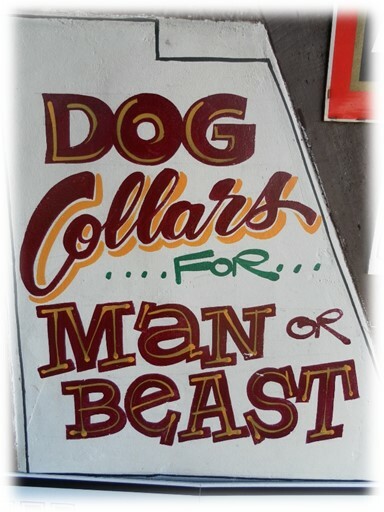 Sign outside a leather shop. Yes, cows tend to be vegetarian, but you still have to kill them to make the leather. I was reminded of a young man working the booth at a local farmer's market, who was extolling the virtues of the organic beef his family raised. When I asked him, "Were any animals harmed in the production of this meat?" he quickly answered, "No!" However, when I challenged him further, he had to admit that they did kill them. I noticed that a lot of these signs had been erected in recent years. I guess we all recognize a stream train, but I haven't seen one in commercial operation for a very long time, so this seemed a bit odd. On the other hand, what should the picture look like instead and still be effective? My hometown area (the Riverland) is a big fruit-growing region with lots of citrus, stone fruits, and vineyards. For many years, fruit flies have existed in parts of Australia, and it is illegal to transport fruit out of infested areas. The main highway going from the state of Victoria to the state of South Australia has a 24-hour, manned roadblock at which fruit is confiscated. 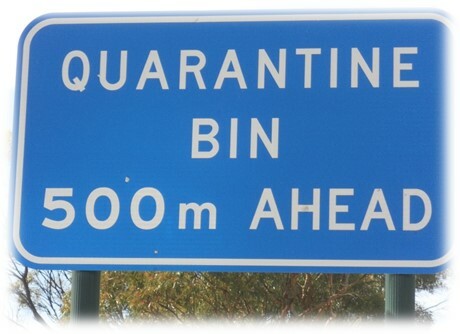 This particular sign was on a lessor rural highway some 20 miles outside the Riverland. It is an honor system in that drivers are asked to dispose of their fruit into the bin, but sometimes law enforcement personnel stop cars further down the road to check. Failure to comply results in a heavy fine. Mary had a little lamb, You've heard this tale before. But did you know she passed her plate, And had a little more? Mary had a little lamb, The Doctor was surprised. But when Old MacDonald had a farm, He couldn't believe his eyes! If you saw this just on its own, you'd be hard-pressed to figure out its meaning. However, when seen next to a gas station (AU: roadhouse), you might have a chance. The fundamental thing to know is that petrol is what we in America call gasoline. 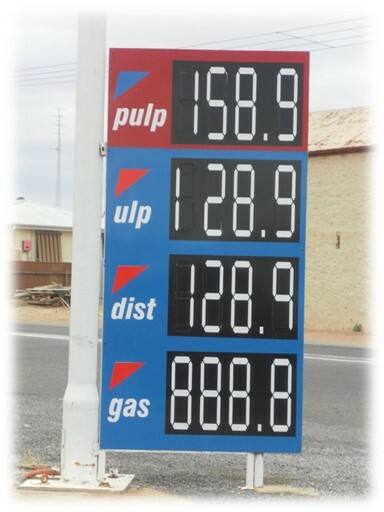 Given that, pulp is premium unleaded petrol and ulp is unleaded petrol. Down Under, diesel is called distillate, and abbreviated dist. And gas means liquified petroleum gas (LPG). Of course, these notations only apply on days not involving a full moon! 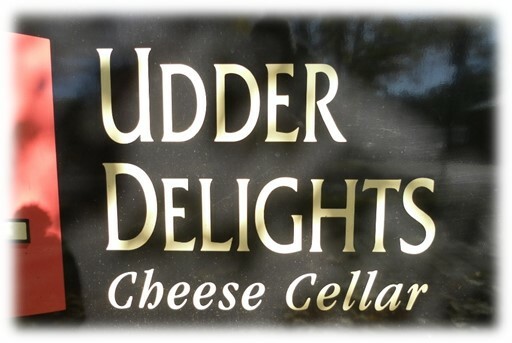 Although quite predictable, I though this sign was udderly amusing! 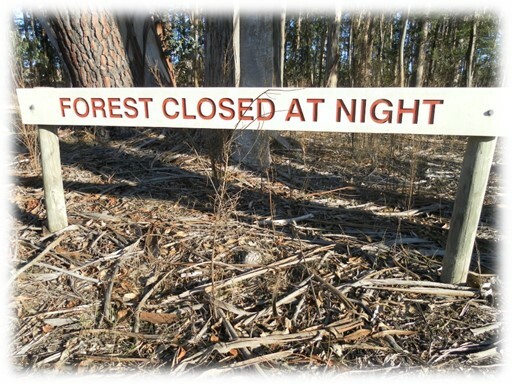 Certainly the park containing this forest had daylight-only access hours, but I couldn't help thinking having this sign at the edge of the forest once inside the park was a bit strange. Perhaps it was intended for the animals! 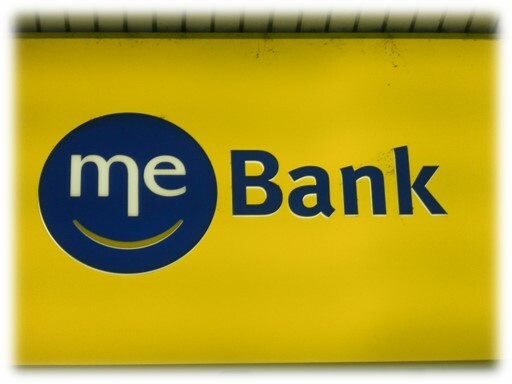 From a branch of Members Equity Bank Limited, operating as ME, a national bank based in Melbourne, Australia. From their promo material, "We believe that banks have become too complex and the best kind of bank for our customers is one that simply helps you get ahead." We've already seen the kangaroo warning. In this case, we need to watch out for emus as well. As for the other critter, it looks a lot like a frill-neck lizzard (which was featured on the 2-cent coin until that was discontinued). In the latter case, the warning is more about not running over them than being concerned about a crash. 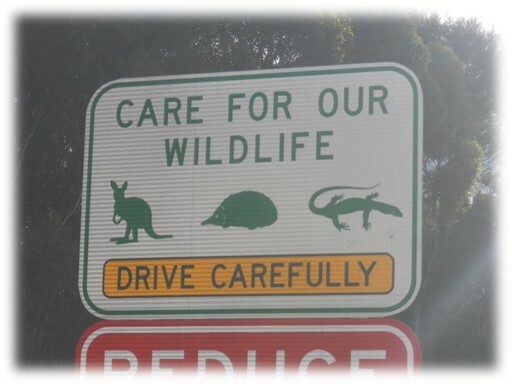 During my short visit to Kangaroo Island (where this photo was taken), there were so many dead kangaroos and wallabies on the roads—hit by vehicles—that I saw a number of carcasses being eaten by goannas more than three feet long. Here we have a wallaby, a spiny ant eater, and a goanna. I got to see live ones up close. From the same leather shop as featured earlier. 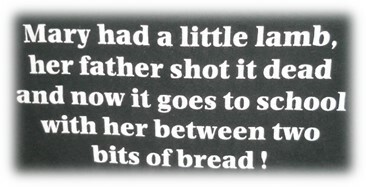 From a building in an old German Lutheran-settled town in the Adelaide Hills. That said, I saw no evidence of any concubines. As they say, "The Lord moves in mysterious ways." At the Cape Jervis ferry terminal for Kangaroo Island. At a glance, this is an interesting set of things to prohibit.